Who doesn’t sing along with UB40’s ‘red wine’? I do! Barbossa is located near Mechelse Plein, a cozy square in the centre of the city, known for its various cafés. The bar used to be an undersized, dark pub changing owners every 6 months. Team Barbossa has renovated and restyled everything from walls to ceilings and opened their wine bar in September 2016. 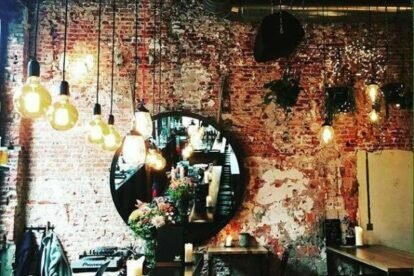 I adore the interior decoration of the place, a big round mirror, a brick wall, lots of green and flowers, beautiful lamps, wow, it could be on the cover of a magazine! Here I like to meet up with the girls to have some wine and talk, maybe also have a cocktail and talk some more, order tapas and, did I mention we talk? My favourite wine on the menu is Domaine La Maurine, Engougement 2013; intense with a taste of red fruit and dark chocolate, mmmh, chocolate! The menu is extensive. Take a good look and check it out. The summer terrace is great; enjoying a fresh wine while looking at the church at the other side of the street and some people passing by.